Jo Ash is a singer and keyboard player from Ely, releasing her first LP of self-penned compositions. It is an album of introspection, intensity, imagination and above all of confident, well-structured song writing. The first two tracks have a broad cosmological theme as referred to in the album title, with ‘Otherworldly’ a strong opener to the collection with its orchestral introduction before the acoustic piano and voice drive the song and lift its haunting chorus. Jo’s piano style is rich and compelling on many of these tracks, on ‘4D Journey’ it adorns a stealthy synthesiser bass pulse and another arresting chorus. If the album generally tends towards slower tempos, in contrast the spirited ‘Story Behind Your Smile’ dances along briskly, ably supported by guesting guitar, bass and drums. ‘Adrift’ and ‘I See You’ are stately ballads where Jo gives full range to her clear, pure voice. ‘Her Eternity’ is a waltz led by some darker piano textures and tempo changes. ‘Smoke And Mirrors’ is a progrockish concoction with marching orchestra, spiky strings and a complex many-section arrangement. ‘Embers’ is a favourite of mine; with minimal piano and backing voices it still achieves a lush, emotive sound and it features one of Jo’s best vocals. ‘Blue Heart’ uses the repeating waltz rhythm of the echoing piano to great effect to counterpoint the abstract sentiments of the words. For the final song a foreboding drum beat underpins a dark lyric musing on the inevitability of time passing and the idea that we only have ‘30,000 Days’ of life? The sombre chorus drives the song, ‘…here I am walking this Earth….’. It is an unusual and haunting end to an impressive debut album. 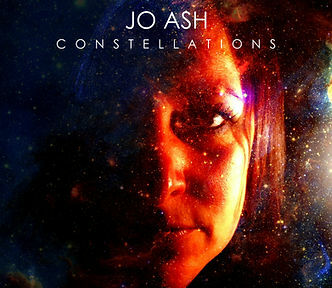 This entry was posted in Music and tagged album, Constellations, Jo Ash, LP, review on October 14, 2018 by iknoweno.